To make a secure, confirmed booking for Rio Guesthouse, you are required to pay a non-refundable 10% deposit, and then the balance is paid when you arrive. Unfortunately we cannot hold/reserve rooms until the deposit has been paid. At least 7 days notice is required of cancellation. Late cancellations (less than 7 days) and no shows will be charged for 3 nights (or payment for full stay if less than 3 nights) plus 50% of your booking (if longer than 3 nights). Please confirm you arrival time the guesthouse 24 hours prior to arrival. THIS IS IMPORTANT FOR ANY EXPECTED ARRIVAL TIMES AFTER 4PM. 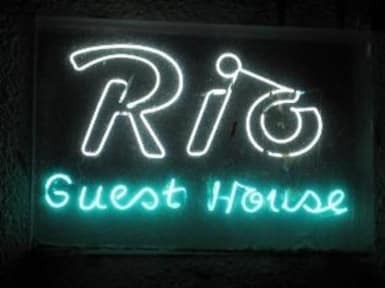 Rio Guesthouse is a relaxed and friendly place to stay and is ideal for the independent traveller. 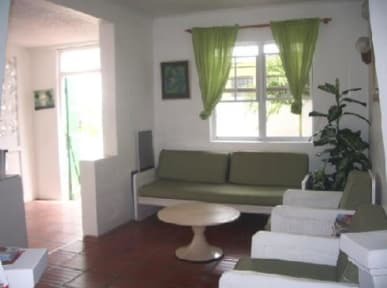 We are a 9-roomed guesthouse in the heart of St Lawrence Gap, within walking distance of the many clubs, bars and restaurants of the area and a stones throw from the beautiful Dover beach known for its water sports and a mile long of pure white sand. En-suite bathroom with self contained kitchen which has a small electric stove, kettle and fridge-freezer. A/C is available (at an additional cost US$2.50), cable television, ceiling fans and security safe (non insured). The room can sleep 3 persons comfortable as it contains one double and one twin bed/sofa. Private bathroom, prepaid A/C, two twin beds and cable TV (can be placed together to create a double), security safe (non insured), wall & ceiling fan . Shared bathroom (which is cleaned daily), contains a single bed, security safe (non insured) and ceiling fan. The rooms are all cleaned every 3 days and fresh sheets and towels supplied regularly. All the windows in the rooms have mosquito nets and most have burglar bars for your security. The whole house has access to a central kitchen which is fully equipped with gas stove, fridge freezer, individual cupboard space, microwave, kettle, toaster, pots, cups, crockery, cooking and eating utensils and coffee making facilities. There is also a dining area and lounge facilities which include cable TV, newspapers, magazines and board games. We also have a breezy balcony where guests can meet other guests and socialise. Paula and Dennis are good hosts. Good location. Good space for my scuba gear. Clean room and kitchen. Will come back if I'm in Barbados again. Stayed for two weeks in March as a solo female traveler. Great place to stay, incredible value for money and location is less than a minutes walk to Dover beach. Paula & Denis who run the guesthouse run a tight ship, keeping the place spotless and helping out with all of your needs whether it be car rental or getting to and from the airport. The Guesthouse itself is very social, most occupants catch up on the balcony in the late afternoon before heading out. Fantastic place for a solo traveler! Denis was super helpful and nice. The hostel is located right around the beach and restaurants and a 5 min walk from clubs and bars. There's a decent balcony where you can go up for a smoke or socialize with other visitors. The room does get very hot as there is not nub air circulation but still very clean and comfortable. Definitelly will go back when I visit Barbados again! Thank you again for your hospitality. Dennis is a great bloke and is very knowledgeable and will help out with anything. Drove me to the US Consulate (for a small fee cheaper than taxi) for my visa run. Looking to save money on your E3 visa run - this place works fine. Can catch local B$2 buses everywhere, including to DHL to pick up passport on the #3D bus and easy to get to bridgetown and other coastal spots for very little on the #11 bus. Extra couple of bucks for the private room with private bathroom worth it. The Rio Guest house has a nice atmosphere in a good location. It isn’t a Hilton but at this price, don’t expect it to be. Rooms are clean and tidy and towels are changed every three days. We stayed in a twin room with ensuite toilet and shower. There are full kitchen facilities downstairs if required. The guest house could do with a lick of paint and freshening up as it looks a little tired in comparison to some of the photos shown. We would stay here again. next time i can make it to barbados, i will stay here again! In a good location just a short walk to the beach and local bars and restaurants. I used the kitchen to make my own dinner one evening which was very useful. The staff were polite and invited me to join their buffet on Christmas Day. There was a small balcony to meet other guests. It's a fairly basic/standard guesthouse and I found it quite expensive for the quality. Also took ages to check in - the owners were saying they didn't have our details despite us emailing over 24h in advance to confirm arrival time etc. The basic amenities are all there (kitchen, fans in rooms etc) but we all had the feeling of being an inconvenience in someone else's home, not particularly welcoming. That said the location is great and we had no significant problems. I was made to pay for my reservation in cash. The room was tiny, lying in single bed I could read both arms out and touch the walls on either side. Linen requires updating. Bathroom requires more frequent cleaning. Safety deposit box didn't work. After requesting wifi password, I was told I had to bring my devices to staff to sign in, so I had to reveal my devices to staff with nowhere to lock them up which made concerned about the security of leaving them in the room.